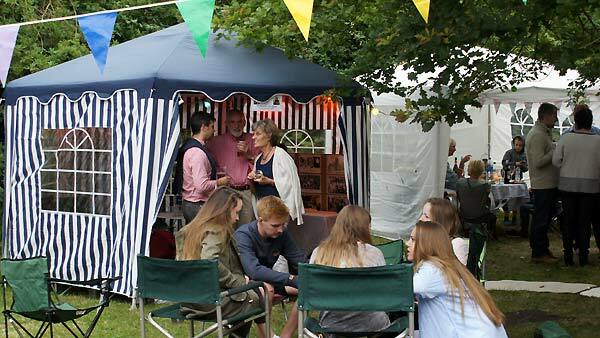 The Old School Playground came to life again as Farringdon made the most of the last celebration to be held in the Rev. Thomas Massey's Folly, which will be officially handed over to the new owners at the end of the month. This area, for many years the playground of the Village School, will be a mix of car park and private gardens when the development planned for the site is eventually completed. At some undefined time in the future, a new village hall may be constructed for future generations of Farringdon residents. 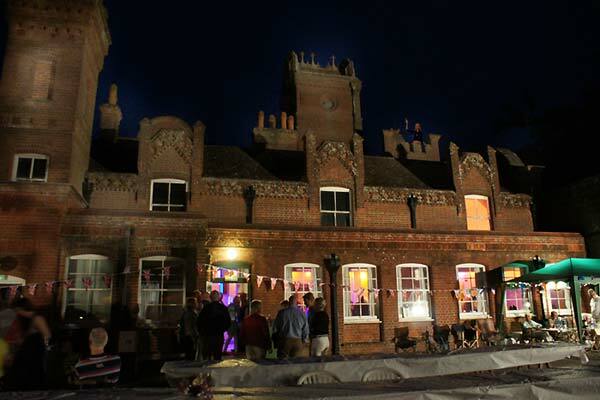 The old building was expensive to maintain and heat, the eccentric layout was far from ideal as a Village Hall but, for generations of villagers, the Folly holds many memories of dances, dinners, shows, wedding receptions, birthday parties and a host of social events that were such an important part of village life. 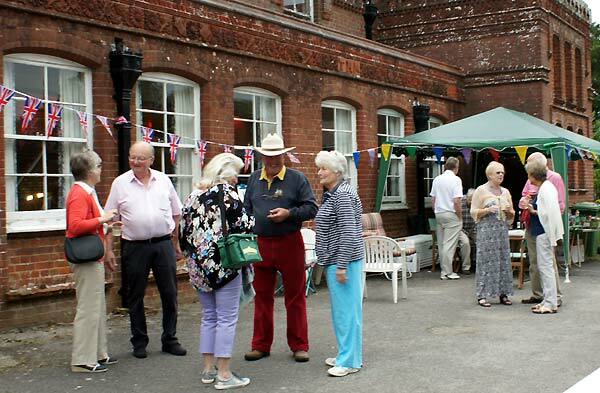 Many of those who attended the Farewell event were pupils, or parents of pupils at the Village School where Pauline Hoare was headmistress for so many years. Lifelong friendships and marriages, even the occasional divorce, began within the walls of Massey's Folly. It is difficult for those who have arrived in the village in recent years, in an age of social media and instant communication, to understand how much of the social life of Farringdon revolved around the Folly. Despite all of the shortcomings of the building, and there are undeniably more than a few, many will be sad to lose yet another cornerstone of village life and although the shell of the Old Folly will remain, the heart of the building will be gone, only surviving in the memories of those enjoyed the countless events that have been held in the unique building conceived by the Rev. Thomas Henry Massey. 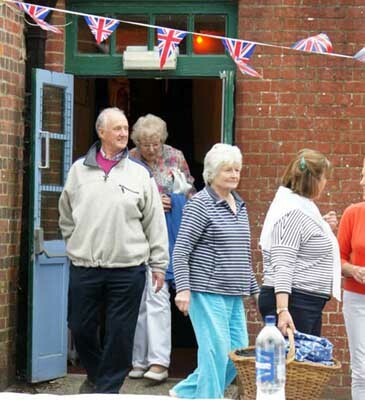 For one last time the Village Hall was the venue for a Village Party, a farewell bash for Massey's Folly. The 'Biz', as always, arrived to cover the event but your photographer found his his entrance barred by the security guards on the gate. Valid ID, parish immigration papers, passport (I do think the body search was a bit over the top) and last but not least, a valid admission ticket were required to satisfy the demands of the highly trained security staff manning the entrance barrier, behind which, an assortment of Village Gazebos had been erected under the trees. 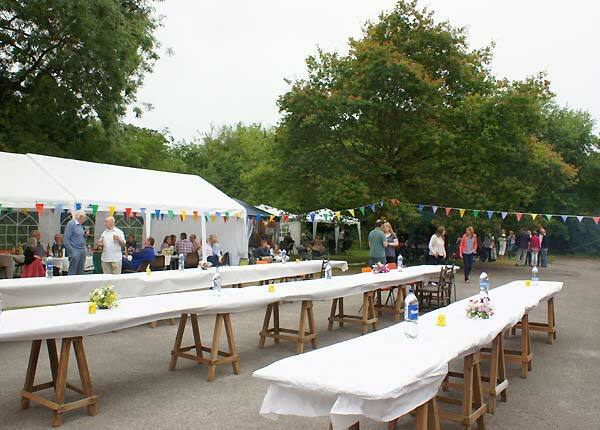 A large official dining tent, occupied the remaining grass area, which proved itself very useful during a brief spell of light rain later in the evening. 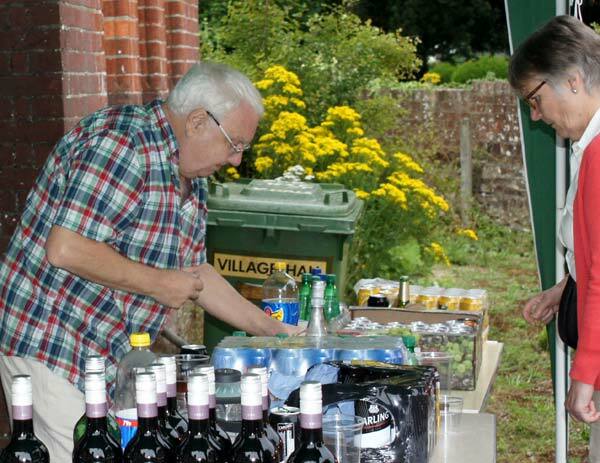 Roger and John were in action behind the Village Bar, (although Roger was keeping an eye on your photographer when this picture was taken) an absolutely essential facility for any Celebrations in the Folly, providing an assortment of wine, beer and alternative beverages for the increasing number of revellers who were still arriving as supper time approached. 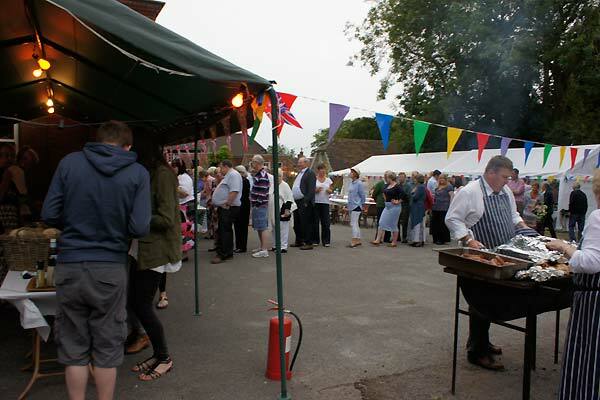 Revellers were arriving fully armed with all the equipment necessary for the evening ahead and were heading across the playground to find a space to settle in preparation for the festivities ahead. 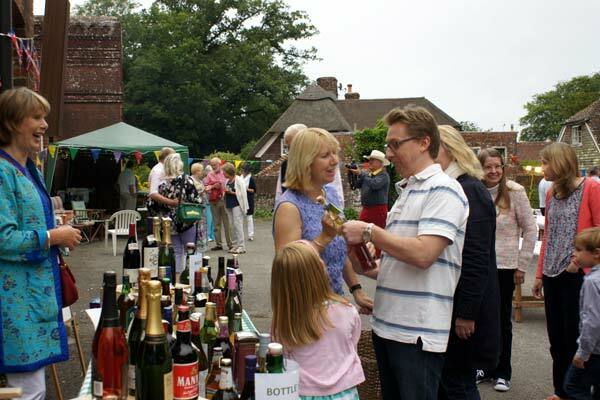 There was also a fair selection of refreshments available from the bottle stall, if you were lucky enough to draw a winning ticket, although Gill and Anne needed to convince Matt that he'd won a bottle of something he really wanted! 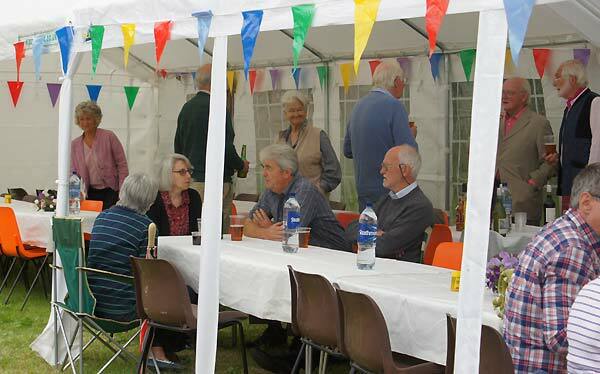 The dining tent was filling rapidly as people continued to arrive, including Bill and Olive Wallace (seated) who were managing the Village Hall affairs in the days when the western end housed the Village School and the Summer Horticultural Show was regularly followed by a Village Party, of which many memories are probably not suitable for inclusion in the Massey's Folly Memory Book. The Mrs Courts, both Senior and Junior had taken up residence in Court's Corner, along with the rest of the family which suggests that none of Clive's customers were heading for the airport on the evening. 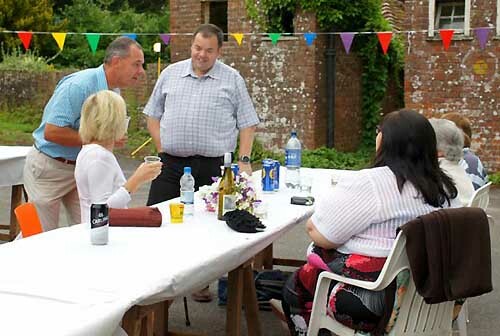 Peter, (2nd left) was also in conversation, husband of Monica and Chairman of the current Village Hall Management Committee, where his negotiating skills were much valued as the sale of the Folly proceeded, eventually, to a successful conclusion. 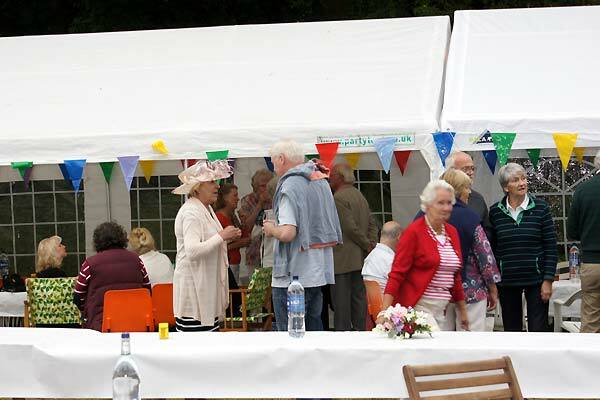 Places in the dining tent were becoming scarce as the supper time approached, the imminent threat of a shower making covered seating the preferred option, although in common with David Horton, some revellers had also taken steps to protect themselves from the elements with some personalised weather protection. 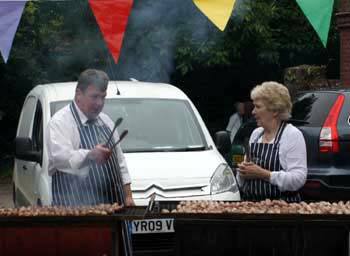 Others were more concerned with the barbecue arrangements as Hartley's barbecue was almost cooked to perfection. 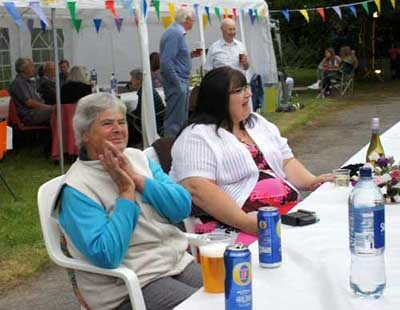 With Chris and Alison poised for action in the Folly Restaurant it was time for David Horton to prime himself at the bar before positioning himself and his radio microphone within reception range of the Village Hall public address system to announce that supper was being served. Roger was keeping an eye on your photographer while John tok a short break. 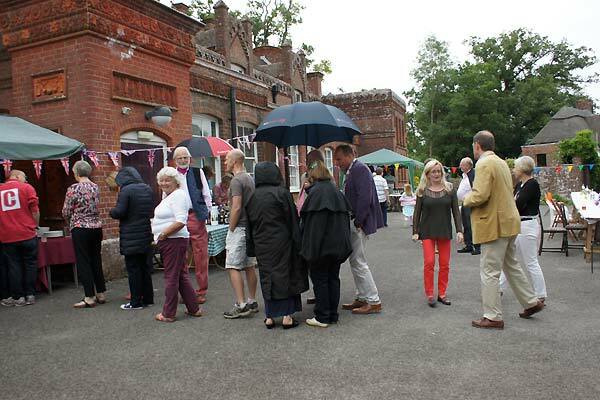 The signal to form an orderly queue for service also heralded the arrival of a short, and fortunately fairly light, shower. At which point, those who had taken the precaution of equipping themselves with umbrellas were proved to have made the right decision. 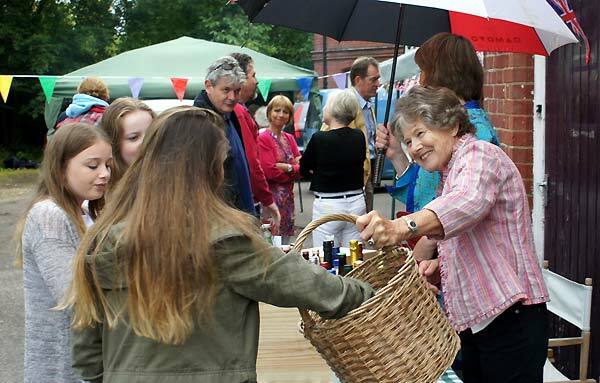 Fortunately, it was only a brief shower and nothing like enough to dampen the enthusiasm of the revellers. . . . .
. . . . . . and the bottle stall (below) simply changed shifts and continued operating with Wendy, (who I am reliably informed is becoming something of an expert on Goldfish,) in temporary charge of the basket containing the draw tickets, leaving Anne free to operate the official umbrella and encourage James to risk a £1 on a ticket. (He doesn't look entirely convinced!). 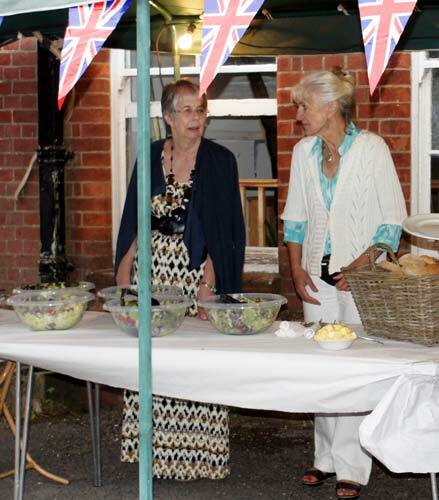 There was a noticeable lull in conversation as people tucked into the meal, but as the food and drink flowed the conversation level revived and the rain cleared, much to the relief of everybody, especially Parish Council Chairman Clive Elderton as he was introduced by MC David Horton. 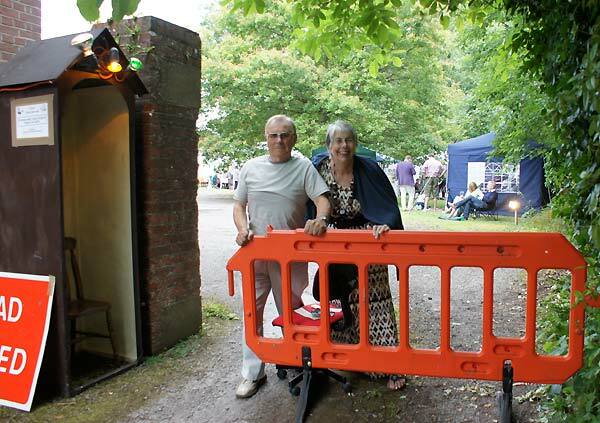 Clive took the opportunity to thank David and Cally Horton and the willing helpers of the Village Social Committee for organising and spending so much time preparing and running the event, an so say all of us. 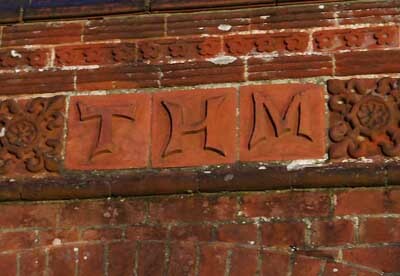 Clive also praised previous and current Village Hall Committee members who had kept the hall running over the years and congratulated Peter Durrant, current VHMC Chairman and Caroline Roe, Clive's predecessor as Parish Council Chair, whose prolonged negotiations had enabled the sale of the Folly to be completed. 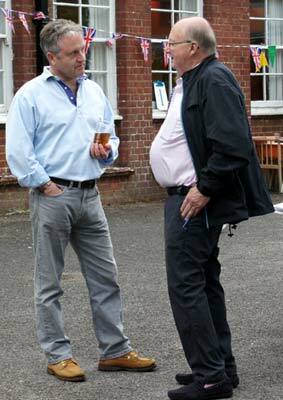 As the Hall is to be sold the two employees will eventually be made redundant, one, of course is David Horton, who for the last two years has been employed as Hall Manager. 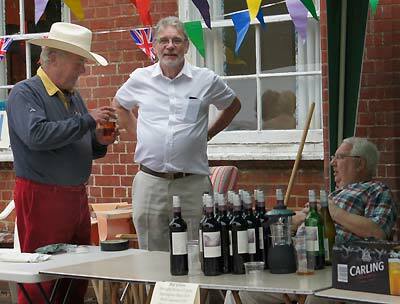 Clive thanked him for all his efforts to promote events in the Hall during his term as manager to maintain some income for the Village Hall. 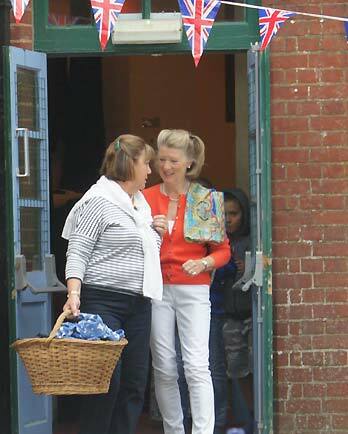 The other village hall employee was Jenni Baumber who has kept the hall spick and span for the last ten years and for even more years was the booking clerk in the days when the Hall was in frequent use for various village events. 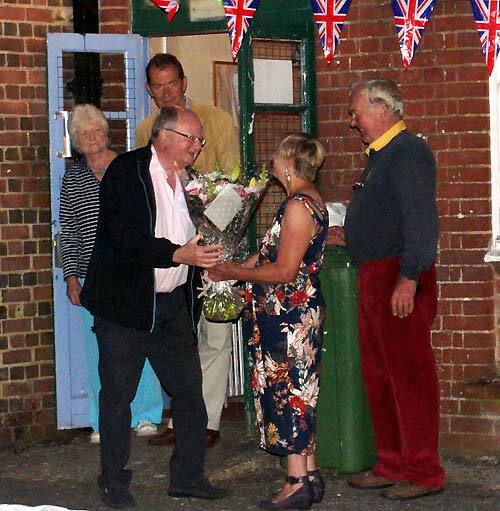 In recognition of her efforts Jenni was presented with a bouquet by Village Hall Management Committee Chairman Peter Durrant under the watchful eye of David and Cally Horton . 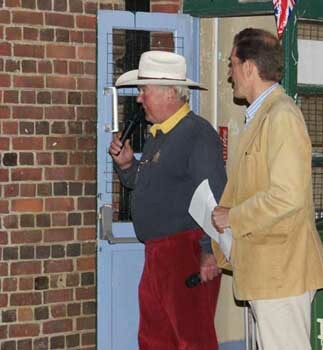 Clive ended with a reference of the Village Hall that is yet to come and although there as yet no confirmed plans he urged all present to become actively involved in the project, essential if the Hall is to meet the needs of the Village in the future. Speeches over it was time for the music and the Zig-Zag Band took to the stage, proving themselves a worthy act for the final public performance in Massey's Folly. Farringdon "dancers" of varying skill! were soon leaping around the floor, as the Zig Zag Band played into the night, no complaints from the neighbours for this event, as they were all there! After a tremendous performance from the band and several demands for encores the night came to an end, a heartfelt farewell to the Folly . . . I wonder what the Rev. Massey would have made of the night's events . . . Thanks to David and Cally, John and Chris, Alison, Roger and Chrys, Robin and Jenni, David W, Gill, Anne and Tim and all those who worked so hard to make this a memorable evening. 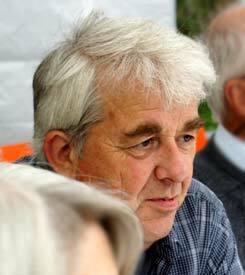 Chrys Browne is aiming to gather information from villagers past and present about their memories of Massey’s Folly.
" . 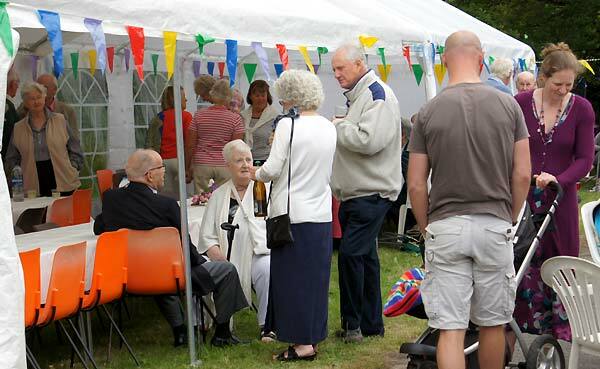 . . A number of people very kindly shared some of their thoughts in a book that was available at the farewell to the folly party last Saturday, but I am aware not everyone was able to attend and it would be good to hear from as many people as possible. I feel it is important to capture the past in words and photographs – it is part of our children’s and grandchildren’s heritage. If I get enough responses I will explore getting the work published. People can contact me via e-mail "